This has been the central thrust of Transparent this season. 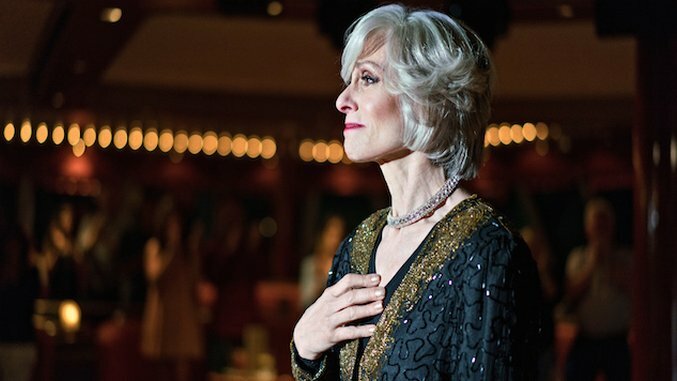 As I wrote of “To Sardines and Back” and “Just the Facts,” Jill Soloway’s gossamer reflections on the content of kinship suggest that “family itself is home, even as its architecture changes.” On the cruise, in “Exciting and New,” there’s no respite from pain—or “the size of my fear,” as Maura says so poetically—but there is the recognition that each Pfefferman bears it: the weight of past trips, past sicknesses, past holidays, past fights. Though Josh is so bereft that he begs off from dinner, and later castigates Ali for the closeness they’ve built, the Pfeffermans seek the familiar as expatriates might, gathering together to speak their common tongue as if foreigners in a far country. After a season, or perhaps a lifetime, in which she’s felt adrift from her own blood, Shel’s performance at the Spinnaker Lounge marshals the force of a plea, or a prayer—an act of “coming out” as the self she once was, stepping from “the darkness of a secret” into the stage’s bright light. With her wide, wet eyes and half-fearful voice, gaining confidence as she embraces the contradictions of Alanis Morissette’s “Hand in My Pocket,” Judith Light, in as masterly a feat of acting as I’ve seen on television all year, delivers Shel Pfefferman’s finest hour—and director Marta Cunningham holds tight all the while to her irrepressible face. “No one’s got it all figured out just yet,” she says, revising Morissette’s lyric to reflect the universal, and this is, indeed, the lesson of Transparent, the reason we circle around its hearth. By the time Ali, Sarah, and Maura lead the crowd’s standing ovation, and Light ends the season with Shel’s grateful bow, it does seem that she’s once again at home in her family: No one can see her like they do.